The Los Angeles City Council voted this week to approve a new joint venture partnership and project timeline for the Grand Avenue Project, a long-stalled, $950-million Gehry Partners-designed mega-development across from the Disney Concert Hall in Downtown Los Angeles. The project’s revised timeline now includes a 2018 groundbreaking and—don’t hold your breath—a 2022 opening date, according to developer for the project, Related Companies. Chinese developer CCCG Overseas, also known as CORE, has been brought on to invest $290 million on the project. The agreement, recently approved by the L.A. Board of Supervisors, mandates that at least 30% of the construction and permanent workforce must be locally hired and compels the project team to utilize apprenticeships and local training programs to hire workers who have “previously faced barriers to employment,” according to a press release issued by L.A. County. 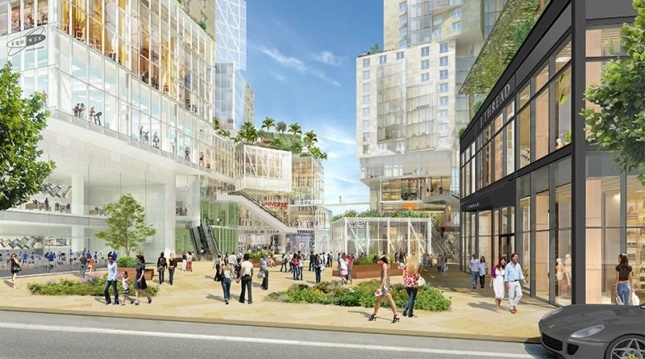 The new agreement between Related, CORE, and the Grand Avenue Authority, a joint powers authority representing the County and City of Los Angeles, ushers in a new spirit of possibility for the delayed project. The deal also signals that the project’s cost, reported to be $650 million back in 2014, has ballooned in the years since. The project encompasses a pair of residential and hotel towers located above a mixed-use podium. The project will include a 300-room Equinox hotel as well as between 380 and 450 residential units, 20% of which the Los Angeles Downtown News reports will be affordable. 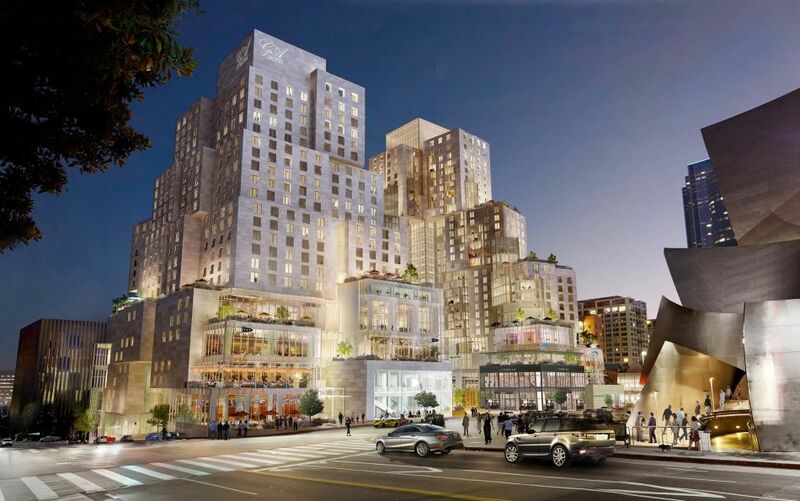 Additionally, the developer has agreed to remain neutral if future hotel workers decide to unionize, a standard provision that paves the way toward local workforce unionization. Grand Avenue Project will consist of two towers at the corner of 1st and Olive Streets with one rising 38 stories and containing condominium and apartment units. A smaller, 16-story building located along 2nd Street would contain the hotel. Current plans call for 200,000 square feet of commercial space, 1,500 parking spaces as well as a large public plaza along Grand Avenue and across from the Broad Museum.